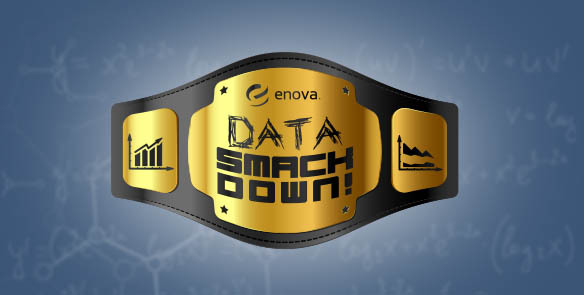 Enova’s Analytics team to host “Data Smackdown” Meetup - Enova International, Inc.
On December 3, Enova will host a data analytics Meetup — dubbed the “Data Smackdown” — at our office in the Loop. We’re providing an opportunity for anyone interested in the analytics industry to knowledge-share and to learn from other analytics professionals while working hands-on with a dataset to solve a real-world problem with the technology of their choice. Enova’s Analytics team uses data analysis techniques and modeling methodologies to boost decision-making processes, which helps to increase profitability and improve the customer experience. The Data Smackdown offers people with varying levels of experience and interest the opportunity to see how analytics can be applied in the case of real-world data analysis. Participants will be able to work independently or as a team, analyzing a data set in a business case. At the end of the night, models will be scored and teams will present their methodology. The Data Smackdown at Enova International is set to take place Thursday, December 3 from 5 – 10 p.m. Attendees should bring a laptop, though those without one can work with a team. Additionally, food and beverages will be provided. Want more information? Contact recruitanalytics@enova.com! Ready to sign up? Just visit the Eventbrite invitation — and reserve your space today!